The Dow Jones Industrials set a new all-time high on Friday, and these two stocks helped pull them higher. Last week, the Dow Jones Industrials (DJINDICES:^DJI) gained 1%, closing at an unprecedented level and continuing the Dow's recent streak of record closes over the past few months. As earnings season is about to begin, investors have paid the most attention to economic data recently, also keeping an eye on the geopolitical events that have caused some consternation in the global community in recent weeks and months. For the most part, though, conditions in the U.S. appear to be solid, and that has helped the Dow overall. 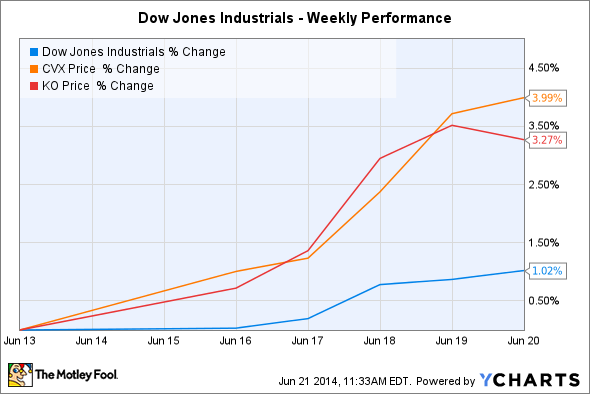 In particular, Chevron (NYSE:CVX) and Coca-Cola (NYSE:KO) were the biggest contributors to the Dow's gains last week. Chevron gained nearly 4% as the oil giant continued to benefit from high oil prices stemming from the conflict in Iraq. In contrast to its big-oil peer in the Dow Jones Industrials, Chevron doesn't have a presence outside the northern Kurdish region of the country, and that could help insulate Chevron's operations from harm if the conflict shifts more toward the central and southern part of the country. Meanwhile, strength in its U.S. operations, which make up about a quarter of Chevron's overall production, continues to help its overall prospects, with California and the Gulf of Mexico marking important areas of concentration for the company. As long as oil prices remain relatively high without climbing so far that they start to eat into demand, Chevron should keep benefiting from greater profit potential. Coca-Cola finished with a better than 3% jump on the week. News from the Federal Reserve that the economy appears to be doing well enough to justify a continued reduction in quantitative easing helped Coca-Cola in two ways. First, it emphasized the strength of the American consumer, and even though Coca-Cola's U.S. beverage sales have been under pressure recently, the Dow component is still working hard to make the most of its well-known brand name as it diversifies into other types of beverages. But perhaps more importantly from an investing standpoint, Coca-Cola's dividend looks more attractive when prevailing interest rates on fixed-income securities are low, and at least for now, the Fed appears poised to keep rates low for the foreseeable future. Coca-Cola's future strategy isn't entirely clear at the moment, but with plenty of possible directions in which to grow, the Dow's beverage giant has plenty of room to recover.